Book moisture absorbers with no leakage and requiring no refills. Book Moisture Absorbers to combat mould. A while ago I ordered a second hand copy of an out of print book. The book was published in 1969 and marks inside show that it spent its life before it came to me in a public library. The public does not seem to have been too interested in this book – its visual appearance is very good, but it had a very strong musty smell. Fortunately there were no visible mould stains. Quality books need to be protected. However, even the smell is an indication of mould. Normally mould would be caused by actual water damage, but being stored in humid conditions for a long time (as this library book probably was) can produce the same effect. We have all seen mould forming on food, but, provided there is a certain amount of moisture, it can grow on any organic matter, including paper. Therefore it can affect not only books, but many other items, which often have a high sentimental value, like photographs or your kids’ or grandkids’ drawings. Mould spores are everywhere, the air around us contains billions of them, and there is not that much we can do about that, but we can influence the conditions they need to germinate, like humidity. Biblio.com has additional advice on the subject. After having gone to all the trouble to remove the musty smell from your cherished books or other items made out of paper, you obviously want to keep them like that. It is important to store them in clean, dry and stable conditions. Should it not be possible to ensure good air flow, because the books are for instance in an enclosed cupboard, Pingi can help. 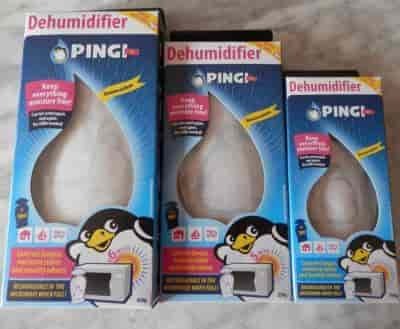 Pingi Book Moisture Absorbers can be placed inside your cupboard, or if they are on a cramped shelf behind the books, will absorb the moisture in the surrounding air and thus keep the humidity in the immediate environment of the books at a low level. Keep your books dry and mould free with PINGI Book Moisture Absorbers! 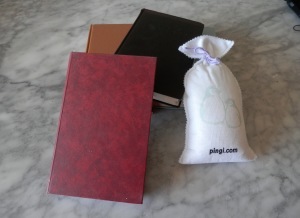 PINGI Book Moisture Absorbers come in three sizes. Moisture traps to keep books mould free.